In May of 2012, I had the remarkable experience of travelling to Havana, Cuba as part of the ACDA International Conductor Exchange Program. The group spent five days there listening to and working with amazing professional Cuban choirs such as Coro Entrevoces, Coro Nacional de Cuba, Coro Exaudi, Coro Polifónico, Coralina, Vocal Leo, and Camerata Vocale Sine Nomine. For three days I had the honor of rehearsing and conducting the Coro Nacional de Cuba and learning from its conductor, Digna Guerra. It was an unforgettable, transformative experience that inspired me to investigate Cuban choral music to use with my own choirs. This article will discuss a few works by two composers – Roberto Valera and Guido López-Gavilán. Roberto Valera has been a significant composer, educator, and writer in Havana, Cuba for more than forty years. His musical output includes orchestral works, film scores, solo piano music, string quartets and electronic music, as well as choral works. 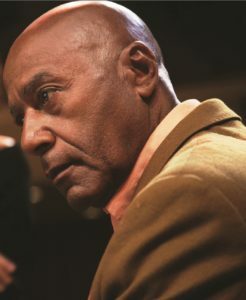 While he has explored the most avant-garde compositional techniques (especially during his study period at the Chopin Conservatory in Warsaw, 1965-67), his choral works are infused with elements of Cuban popular music and its rhythms. Valera composed Iré a Santiago (I will go to Santiago) in 1969 using a poem by Federico García Lorca. Lorca visited Cuba in 1930, immediately following an unpleasant trip to New York. The poem expresses his utter joy at visiting Cuba and describes the colors, sounds and smells he experienced. The score was originally conceived as film music for guitars and bass, with a vocal solo in the middle section. In fact, Digna Guerra was the original vocal soloist. The choral version of the work is performed often by around the world, and regularly by Cuban choirs on tour. 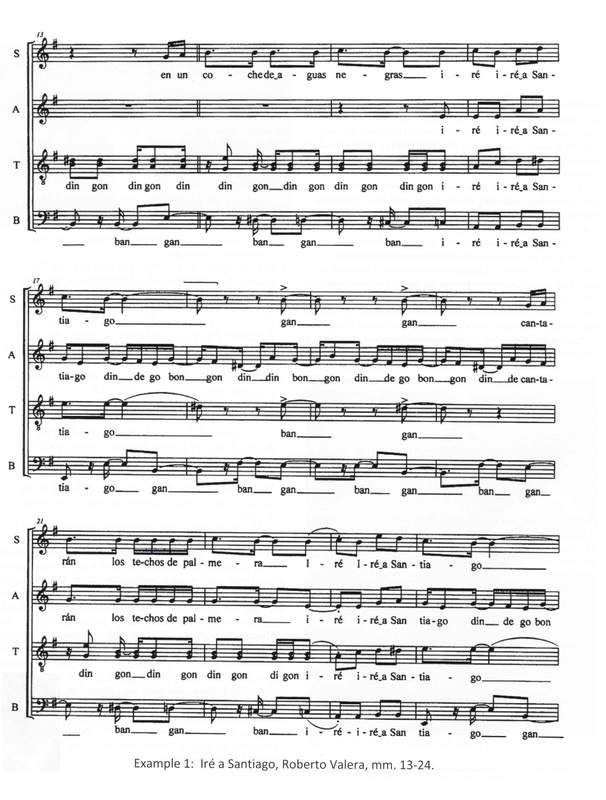 In order to convert it to a choral piece, the composer uses nonsense sounds to represent the sounds of instruments. Valera calls these sounds jitanjáfora. In the opening section, which is in the style of the guaguancó (Cuban rumba), Valera uses the voiced consonants /d/, /g/, and /b/ to represent guitar sounds. This seems to accurately reflect the percussive, yet pitched sound of plucked guitar strings. These are layered in syncopated polyphony among the voice parts. Example 1: Iré a Santiago, Roberto Valera, mm.13-24. In the slower middle section, a soprano soloist in quasi-recitative style is accompanied by choral sustained chords. The third section features the first material again, but with increased intensity. This is created by driving sixteenth notes in the soprano and alto parts, which seem to represent the sound of a guiro or shakere or both. Interestingly, Valera uses unvoiced consonants here to closer imitate the sound of percussion. Some conductors choose to do this last section at a faster tempo which brings the piece to an even more exciting conclusion. Harmonically, the piece is quite tonal and straight forward. The great challenge is the densely syncopated, polyphonic rhythms which Cuban choirs seem to sing so effortlessly. Babalú en La Habana Vieja is inspired by a song from Roberto Valera’s childhood. 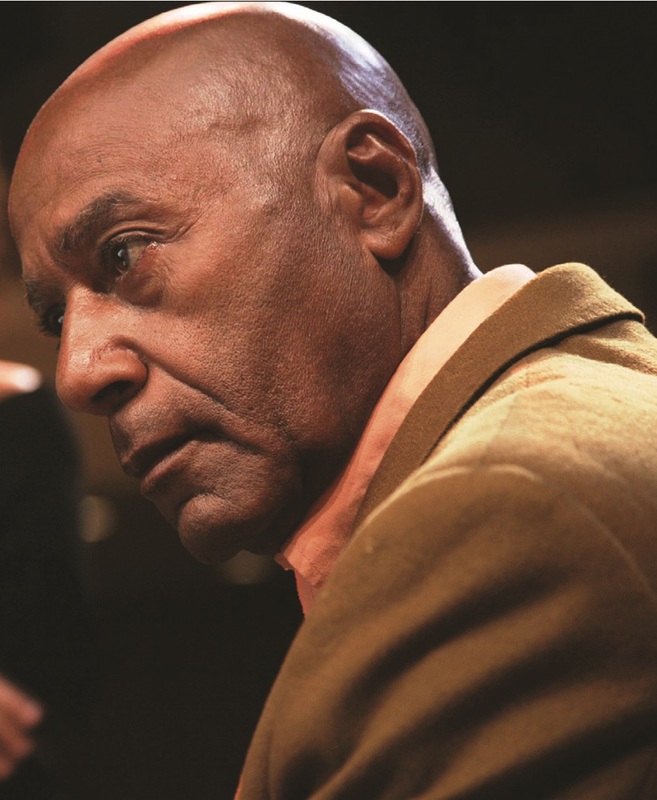 The composer explains that Babalú was a familiar character wandering the streets of Havana. He was an old black man, dirty and barefoot, who the children would shout at and tease. The men would throw lit cigarettes at him, but he would step on them and not feel them. He was a cheerful man who charmed the neighborhood children – always laughing and dancing and singing a tune that Valera uses as the basis of his composition. 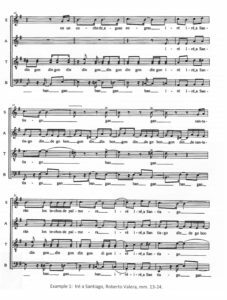 The work is scored for SATB choir (with divisi) a cappella, and is a theme and variations form. The tune is first presented by the altos and tenors in unison in F major, accompanied by ostinato neighbor note patterns tones (A–F / G-F in the bass and d”-c” in the soprano). The first of eight variations is a canon at the unison between tenors and altos (altos following four beats behind) while the sopranos and tenors continue their somewhat static chordal accompaniment. The soprano part is divided, so the texture is slightly thicker. Variations two through seven move at a faster pace, in 2/4 time, rather than the opening 4/4. Rhythmic values are shorter, creating a livelier dance-like spirit. Variations two and three are homophonic, with all voices singing text for the first time. The sopranos and tenors have the melody in octaves, while the altos and basses sing a harmony part in octaves. The main contrast is dynamic. Variation two is forte, and three is pianissimo. With variation four, the texture changes again with the introduction of layered, polyphonic, densely syncopated percussion sounds sung by three-voice parts. These represent bongos and congas, with individual voice parts at times divided into as many as three parts. These accompanying parts present sixteenth-note triplet patterns, while the melody remains in a single voice-part. Each variation changes in small ways – in some, the basses are divided in up to four parts when the melody is in the soprano; when the tenors have the melody, the sopranos are divided into three parts; the key changes from F major to G major for variation six. The lively syncopated rhythm stops abruptly in measure 75 when the sopranos and altos sustain e-flat octaves on ‘ah.’ This is especially shocking with G major so strongly established. 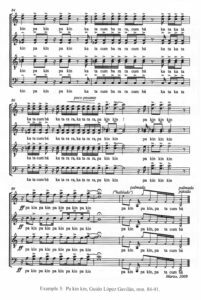 The choir moves briefly through two chords to d ‘-d ‘ ‘ octaves between alto and soprano and a b-flat unison in the tenor and bass, to prepare the modulation to G minor for the eighth and final variation. This one is slow, minor, triple forte, and has an eight-voice homophonic texture. Like the early variations, sopranos and tenors sing in octaves (this time in two parts for each voice part), and altos and basses do the same. 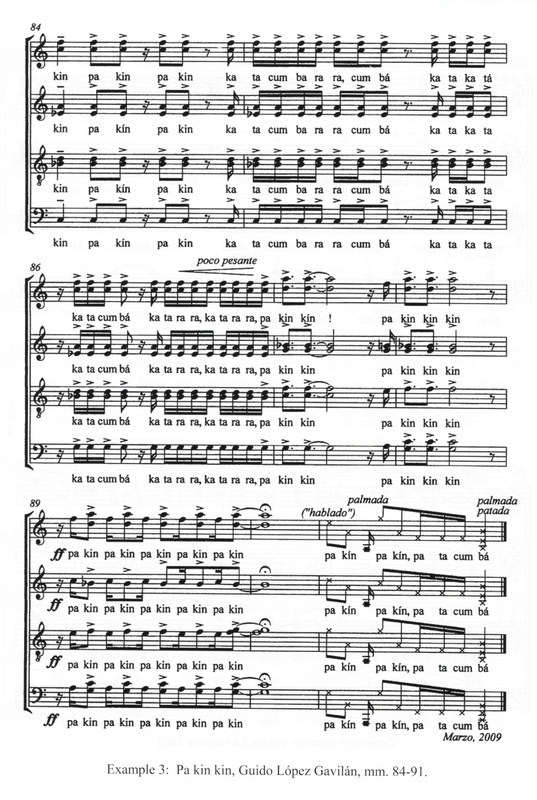 (Example 2) The work ends with a quiet unison phrase for all voices. It is a well-constructed, entertaining work. 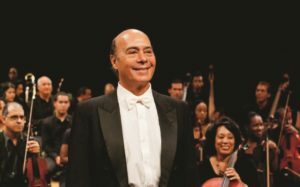 Guido López-Gavilán is an internationally successful composer and conductor. He holds degrees from the Amadeo Roldán Conservatory in Havana in choral conducting and violin, and from the Tchaikovsky Conservatory in Moscow in orchestral conducting. He is a frequent guest orchestral conductor in Poland, Germany, Russia, Hungary, Bulgaria and Romania, and for all of the orchestras in Cuba and many throughout Latin America. 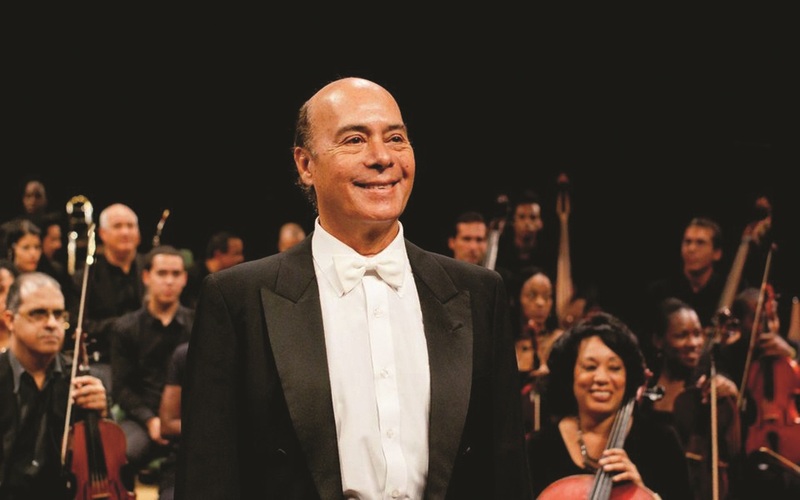 He conducted the National Symphony Orchestra of Cuba on a tour to more than twenty United States cities in 2012. 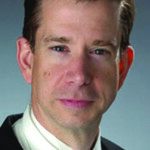 His compositions include works for choirs, solo voice, orchestra, and chamber music. Conga was commissioned for the opening concert of the Sixth World Symposium on Choral Music in Minneapolis in 2002. His music displays a broad range of styles and expression from serious dramatic works of great intensity to humorous, energetic works featuring rhythms of Cuban popular music. 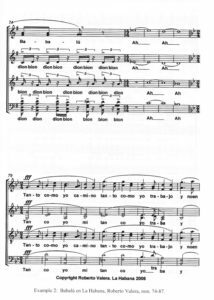 The rhythm and text alone are quite virtuosic, but the harmony is also challenging for the singers with many polytonal chords and triadic harmonies with multiple added tones. This is truly a demanding, but thrilling, work to hear or perform. There is a visual element of staging in this work. In his notes, Gavilán suggests opposing gestures between the women and men – stomping, toe tapping, shoulder shrugging, head shaking, etc. At one point the ladies are asked to make a kissing sound and smile. Percussion instruments are suggested in the latter two sections for rhythmic security as well as timbre. In these sections, choral parts and music for five soloists sound improvisatory, but are actually precisely written out. One can imagine the rhythmic pulse being inconsistent in such a densely polyphonic and syncopated texture. The rhythmic and melodic cells of the piece are in the style of the rumba but are not taken from any particular rumba. 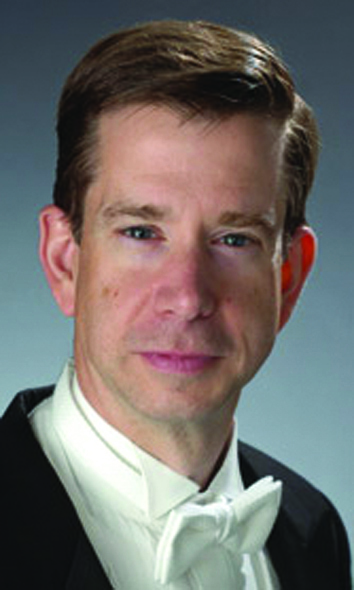 The music also reflects many contemporary compositional characteristics such as free harmony, polytonality, tone clusters, and aleatoric techniques. Moreover, unconventional sound effects occur often – tongue clicks, leg slapping, and floor kicks are among the techniques used. 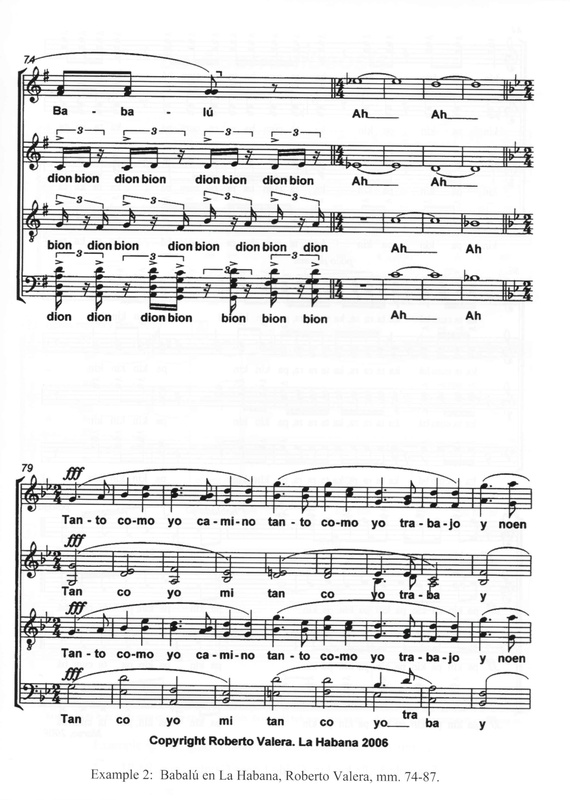 Like many Cuban choral pieces derived from Cuban popular music, the text is onomatopoeic. Nonsense syllables and actual words are used, but merely for their sound or percussive qualities. This work also requires virtuosic performers who are able to hear and sing polytonal independent parts, with the added complication of intensely syncopated, rapid rhythmic patterns. In conclusion, choral composition and performance thrives in Cuba. Many composers such as Guido López-Gavilán and Roberto Valera are inspired by the vibrant traditions of Cuban popular music. Their works usually contain elements of particular dances, extremely syncopated rhythms layered in a polyphonic texture, an expanded tonality, and, perhaps most of all, a spirit of humor and joy of life. López-Gavilán, The Aporrumbeosis, notes on the work by the composer. Contemporáneos Entrevoces. Coro Entrevoces I Coro Nacional de Cuba, Digna Guerra, Conductor. Colibri, 2010. CD. Diaz, Clara. Roberto Valera: Music, Genius, and Cuban Nationality. Unpublished. Gavilán, Guido López. Composer’s unpublished biography. Gavilán, Guido López. La Aporrumbeosis. Havana: Published by the composer, 1990. Gavilán, Guido López. 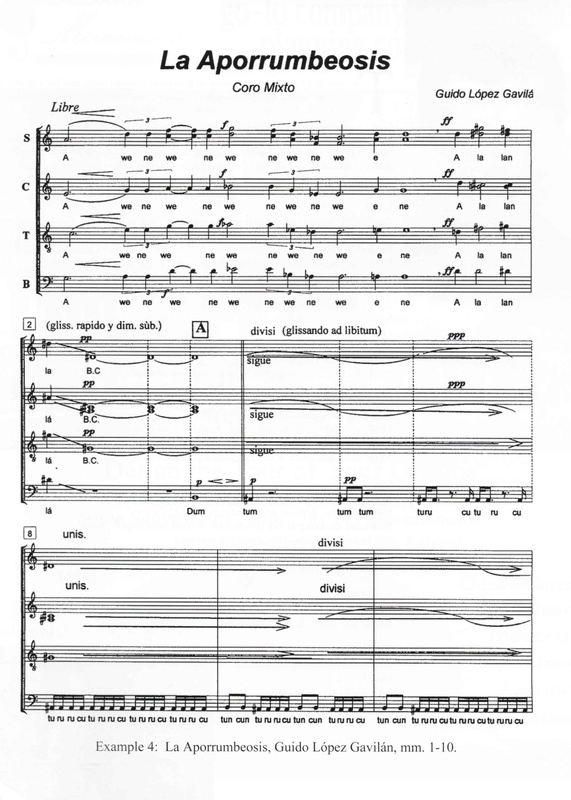 La Aporrumbeosis: unpublished notes about the music by the composer. Gavilán, Guido López. Pa kin kín. Havana: Published by the composer, 2009. Valera, Roberto. Babalú en La Habana Vieja. Havana: Published by the composer, 2006. Valera, Roberto. Iré a Santiago. Special edition for the América Cantat IV Festival. Havana: Published by the composer, 2004. 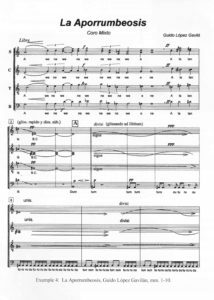 Valera, Roberto: Iré a Santiago for Mixed Choir: an Introspective Analysis. Paper presented as a lecture by the author as PhD Defense. Superior Institute of Art, November 9, 2005.